The Deep South, paranormal plotlines, and mysteries go together like chocolate and cake in this book! 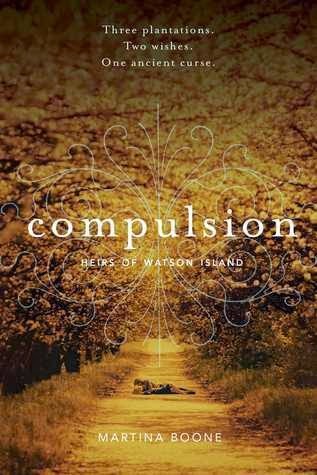 Martina Boone’s Compulsion is an entertaining and easy-to-read new addition to the supernatural world. We start off by meeting the main character, Barrie Watson, after she’s just traveled from California to South Carolina after her mom passed away. But what Barrie doesn’t know is that there are secrets upon secrets spilling out of Watson Island, Barrie’s ancestral home. And of course, the two other families involved in these secrets—the cute boy-next-door, Eight, and Barrie’s cousin, Cassie—are making matters complicated in their own ways as well. It doesn’t help that Barrie has her own secrets, too. She finds lost items; they call to her. At first, this book will make you feel very lost, confused (the family lineage was difficult to wrap my head around, even with a visual aid), and perhaps even bored. Don’t give up! It’s not as shallow as it first appears. Barrie’s odd characterization, from her tall purple heels to her tendency to over-explain the details, will all grow on you. And, even though the third-person point of view seems to limit how much you really get to know her, the narration style works out in the end. I wasn’t even that interested in Eight at first, which is one reason why the book started out so slow for me. If I can’t find myself enjoying the love interest, I tend to want to shut the book; but he grew on me, just like Barrie. After you’ve gotten past the first 70 pages or so, the pace of the story will start evening its way out. You may not get sucked in, but you’ll have a reminder in the back of your head when you’re not reading that you still haven’t found out what the heck is going on on Watson Island yet. Additionally, the tone of the story matches up to what someone from the Midwest (like myself) would imagine small Deep Southern islands to feel like. There’s the sense of traveling back into the past; what, with the small-town gossip, tearooms, and gothic-esque structures, and all. It would have been nice if the book had more southern dialects though, because, well… accents are fun. In the end, this read will sneak up on you. Its plot isn’t fantastic, its characters aren’t wholly original, and it’s a little boring at first, but it is a good read for those who are looking for a light paranormal book—light as in it has no vampires, werewolves, and other dark and menacing creatures, not light as in it’s a small book. Also, it’s a great read for fans of Kami Garcia and Margaret Stohl’s Beautiful Creatures or even Lauren Kate’s Fallen. P.S. The cover for this book and the inside of it, as in the naked book’s spine, are beautiful—except for the couple on the road. I’m not sure who they’re supposed to be because that is NOT how I pictured Eight. Thanks for the review. I love gothic reads, especially set in a small town. This has been in my to read list for awhile.